Made of food-grade stainless steel, FDA approved, no metal aftertast, plastic free, reusable and environmentally friendly， convenient and portable for outdoor activities. 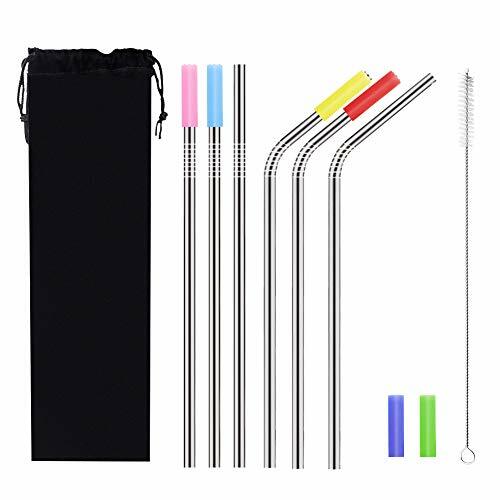 6 mm wide metal straws and handle thick, fit through the lid slot of your 20oz 30oz stainless rumbler ， Stainless steel straws can keep the taste cool when you are having cold drinks. The stiffness also make them great stir sticks. Suitable for a party， a family reunion, girl\'s night out, cocktail party, patio BBQ, picnics, and more. Great gift choice for your families and friends. Comes with one 9 inch cleaning brush， you can rinse off residue more easily.